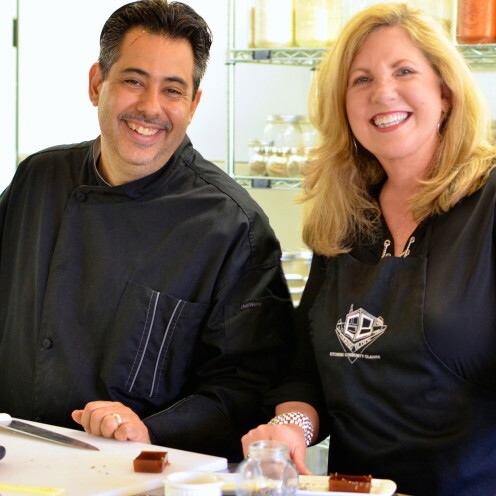 Today I am continuing to bring you recipes for the Spanish Tapas we enjoyed during My Spanish Style Birthday Party at The Cooking Block. Today I thought I’d share the easiest recipe of all: Queso Manchego con Membrillo. I imagine most of you have heard of Manchego cheese. 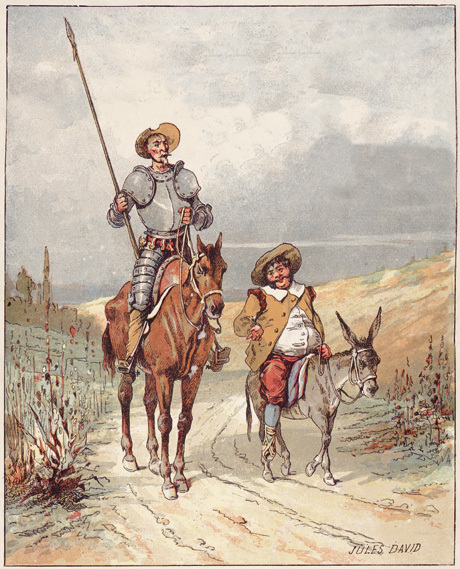 It is a cheese made from sheep’s milk and comes from the La Mancha region in central Spain. Known in Spanish as Queso Manchego, the sheep’s milk used in the production of this cheese comes exclusively from the Manchego breed of sheep. 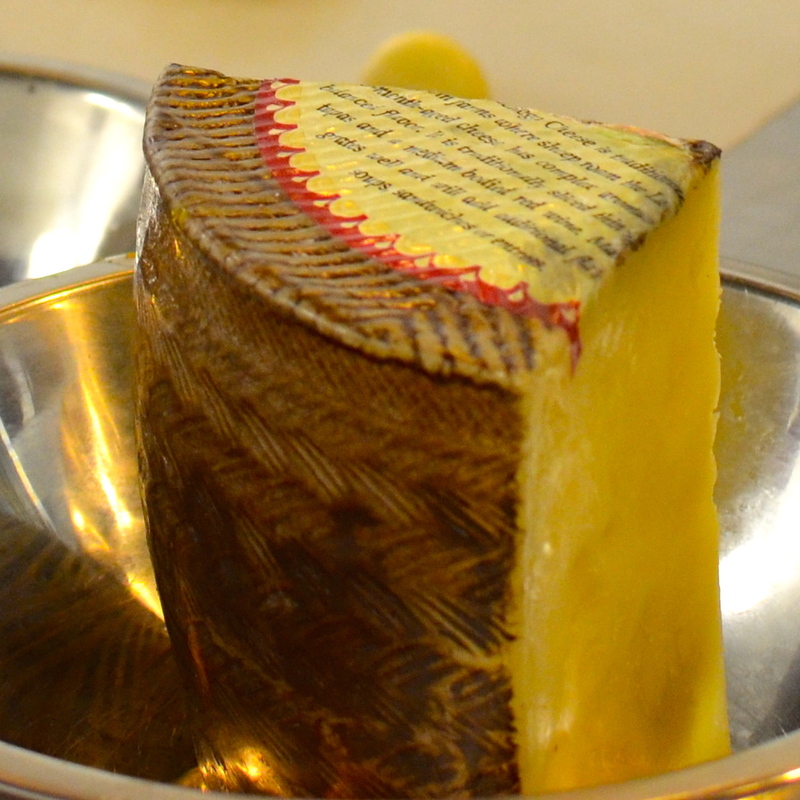 The inedible rind of Queso Manchego is marked by a distinctive and traditional herringbone basket weave pattern that is pressed onto it. Queso Manchego is probably the most famous Spanish cheese. I buy it at my local Costco. It is actually protected under the European Union’s “Denominación de Origen.” Translated that means “The Denomination of Origin.” This is a fancy regulatory classification system that insures that all cheese named Manchego is made only with whole milk obtained from sheep of the Manchego breed, raised on registered farms, located within the designated area of La Mancha, Spain. Ya got that? 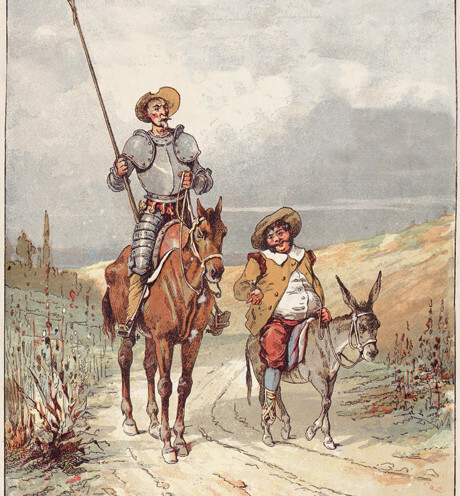 In other words, the cheese I buy at Costco is the real deal, imported from Spain and made from the milk of pretty little sheep that, just like Don Quixote and Sancho Panza, call la Mancha, Spain home. But if you aren’t Spanish or have never traveled to Spain, you may not be familiar with Membrillo. Membrillo is a sweet, jelly-like confection that is made by cooking quince, a fruit that is somewhat like a cross between an apple and a pear. It is too hard and sour to eat fresh and must be cooked to be enjoyed. 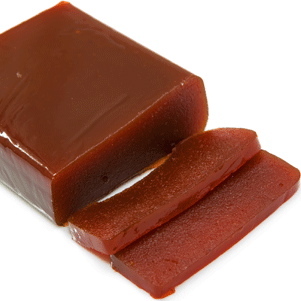 Because of its high pectin content, it is a perfect candidate for use in jams and jellies such as Membrillo. 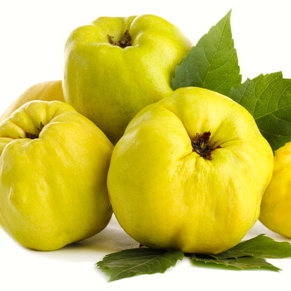 When cooked, the skin of the quince turns red and is what gives Membrillo its distinctive red color. You can purchase Membrillo at stores that carry Latin food or online from LaTienda.com. 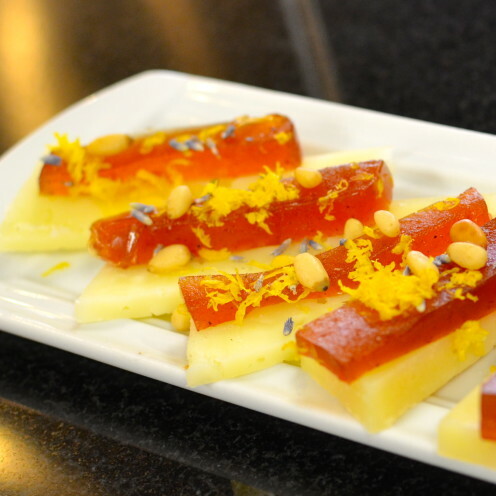 As it turns out, Membrillo is the perfect accompaniment to Manchego cheese, and this combination is a very popular one in Spain. 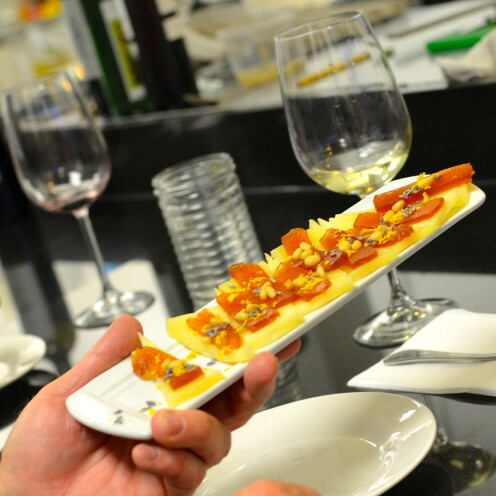 Chef John showed me how to prepare this perfect and simple appetizer or Tapa. 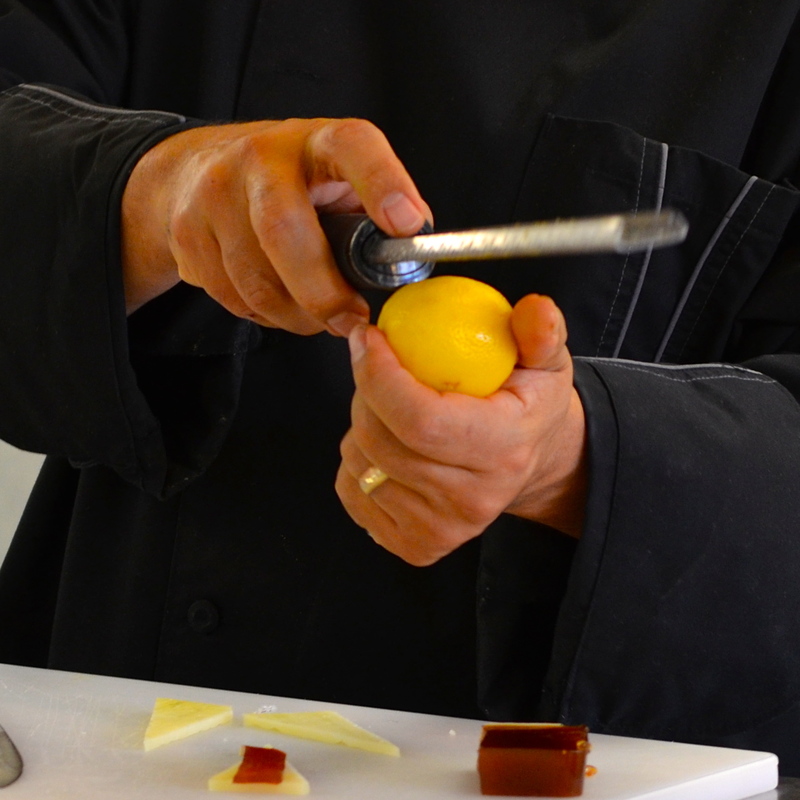 Chef John instructed me to remove the inedible rind from the cheese and slice it into the traditional triangle shape. Then, a thin slice of Membrillo is added on top. a couple of pine nuts, and a little sprinkle of lavender buds. Serve it up at your next Tapas party and everyone will love it! It is simple, elegant, and to Americans, quite unique. This simple yet elegant Tapa is popular throughout Spain. Once you try it, it will be popular with you too! 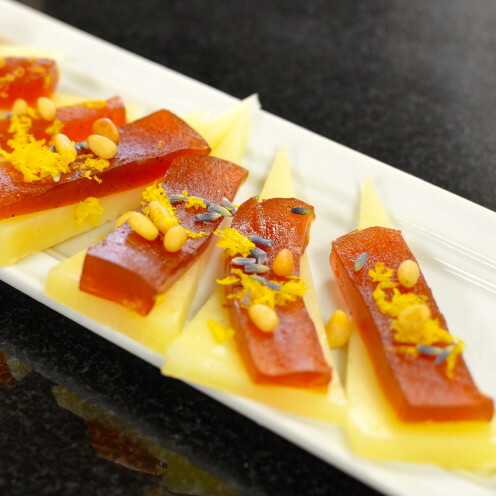 Remove the rind from the Manchego cheese and slice into the desired quantity of ¼" triangles. Place a thin slice of Membrillo on top of the cheese. Sprinkle a dash of lemon zest on top. Add a couple of pine nuts and a touch of lavender. 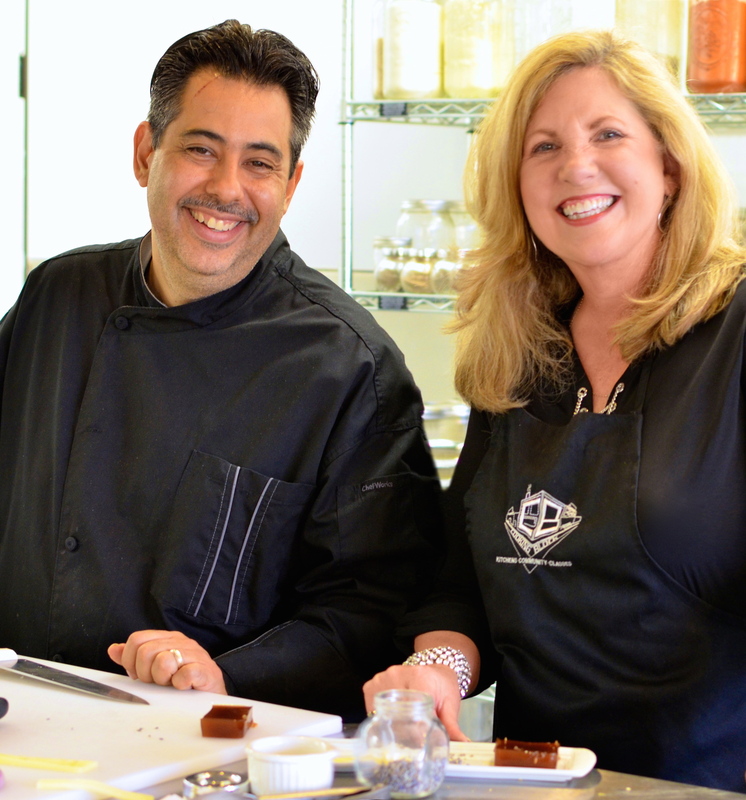 This recipe was given to me by Chef John Shrader of The Cooking Block in Redlands, California.